OK, no one really wants to hear about utility stocks right now, not with earnings season underway and the US market still (as of yesterday) in rally mode. But it can sometimes be a good idea to take a look at areas of the market that may be getting the cold shoulder from the crowd. As noted in “An interesting options development,” open interest (the number of open options positions) can help show whether high options volume is more about traders putting on new positions or closing out existing ones. Yesterday, it appeared to be a case of new positions in Evergy (EVRG), a Kansas and Missouri electricity provider. 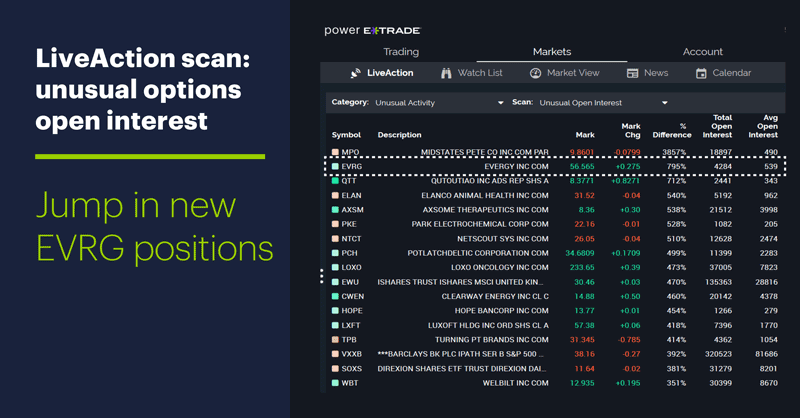 The LiveAction scan above shows open interest in EVRG options was much higher than normal—almost eight times average—yesterday morning. What were traders seeing? If that’s the case, is there a reason they’d position themselves one way or the other—long or short? Sure, non-directional options strategies such as straddles and strangles can sometimes allow traders to profit regardless of market direction, but it’s a fairly safe bet that at least some traders have opinions about the stock’s likely post-breakout direction. They may be considering a few factors—say, broad market and sector trends, stock momentum, and/or sentiment. As the US stock market has continued its robust January rally, utilities have found themselves at the bottom of the S&P 500 (SPX) sector pile—a totally “normal” condition, given utilities have a strong defensive component and investors tend to dump them during broad-market up moves. 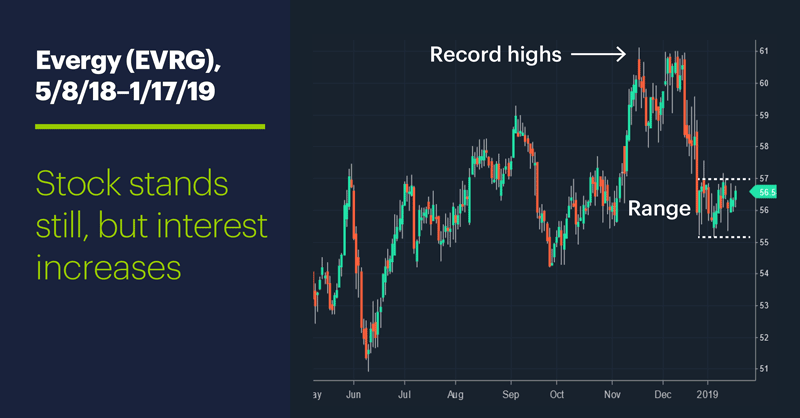 As noted, EVRG is barely a month removed from its record highs, but its recent trading range has shown fairly strong support just above $55, with the stock dropping sharply to that level three times (December 26, January 4, January 14) and holding. But the most important near-term factor (other than next month’s earnings) may be the broad market’s performance. If the US market remains hot, bulls are less likely to dig their hoofs into the utility sector turf. But no market can stay at peak heat indefinitely, and even temporary pullbacks can trigger sector rotation, in which case utilities could enjoy a typical power surge. Today’s numbers (all times ET): Industrial Production (9:15 a.m.), University of Michigan Consumer Sentiment (10 a.m.). Market holiday reminder: US equity markets will be closed Monday for Martin Luther King Jr. Day. 1 InsiderMonkey. Hedge Funds Are Selling Evergy, Inc. (EVRG). 12/11/18. 1 Zacks Equity Research. 5 Reasons to Add Evergy (EVRG) to Your Portfolio Right Now. 1/11/19.